Friday 6 November, 8 p.m.
Sunday 8 November, 3 p.m. and 7 p.m.
Tickets are priced £10 (£9 concessions). You can buy them in person from the box office at the Dancehouse at the following times: Monday, Wednesday, Thursday, Friday: 4 p.m. – 7 p.m. You can ring the box office on 0161 237 9753 to reserve tickets; they’ll hold them for you for four days. Alternatively, from 1 Sept. you can book online via ticketline. Early booking is advised: the performances at the Library Theatre in August sold-out with a fortnight to go. For reviews of Angels at the Library, check out the separate page on the play. A Bengal Tiger and his molls: Rosie Phillips, Jack Williamson, and Abi Gunning. Preparations for Angels with Manky Faces, MaD Theatre Company’s new production inspired by The Gangs of Manchester, are gathering pace. Paul Cliff is making six short films, which will be back-projected in between scenes performed on stage. The photo above was taken during a day’s filming at the Black Country Museum. Even though it’s early days, ticket sales are going strong – a third of the tickets for the Manchester performances (19-22 August) have already been sold. A revised edition of The Gangs of Manchester is now out. The new edition is a smaller-sized paperback and the UK cover price is 7.99. 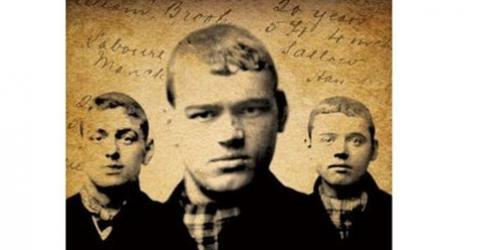 There is one addition to the text: an astonishing postscript to the story of Billy Willan, the scuttler sentenced to death in 1892 at the age of sixteen. This was supplied by his descendants, who still live in the Ancoats district of Manchester. The feature on the scuttlers on Inside Out (BBC1 North-West) was broadcast on 18 February; it’s on the BBC i-player for a week and features some brilliant footage by the Manchester photographer and film-maker Paul Cliff. The historical reconstructions were staged by the MaD Theatre Company. They’re double proper good. The Inside Out website features an interview with Rob Lees, artistic director of MaD. Rob talks about the relationship between The Gangs of Manchester and MaD’s forthcoming production, Angels with Manky Faces. You can also see Robbie Ashworth and Jack Williamson modelling scuttler chic – period costumes for Angels are being made by the wonderful Tracey King. She knows her stuff! The feature was presented by Nigel Pivaro, familiar to most viewers as Terry Duckworth. Nigel now works as a journalist. He’s left Weatherfield, but we have asked him to do a cameo in one of the film scenes for Angels. We’ll keep you posted.